15Gammons is an online realtime backgammon website. Its backend is written entirely in Python using TurboGears and Twisted. In fact, it is the first TurboGears project I’ve started (over 18 months ago); and the last one I ended… I finally had the time to give it the final touches and open it to the public. 15Gammons utilizes the so-called Comet technique of streaming events to the browser over a long-lived HTTP connection for achieving low latency. The Comet part is written using Twisted. I am planning to share some useful code in a later post. The user interface was written using the Script.aculo.us library. Flash is not required, but is optional if you like sound effects. 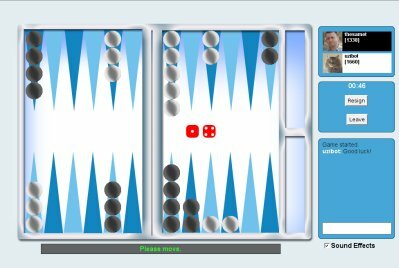 Check it out – play backgammon online in 15Gammons.com! who you managed to make Twisted to work with TurboGears,via some RPC? Yes. TurboGears is talking to the Twisted process via XMLRPC. Ok i tried it and even though I’m not really a backgammon player, i got a good impression. Nice to know you can do such things with TG. I have to create an account, complete with email verification? Yes. I’d like each player of the site to have a rating and a nickname, so existing players can choose who they want to play with.